All-black version of the popular red/black and blue/black AR1. Black patent leather tongue, backstay and A logo. Modernized tongue design that is more comfortable and resists unwanted rotation while skating. The boot carries the same design elements and materials as the second generation - full grain leather in signature tall cut offer both comfort and support from the outside while the Harmony microfiber lining works from the inside. Full length lacing with a recessed eyelet offers countless customization options to get the perfect fit. 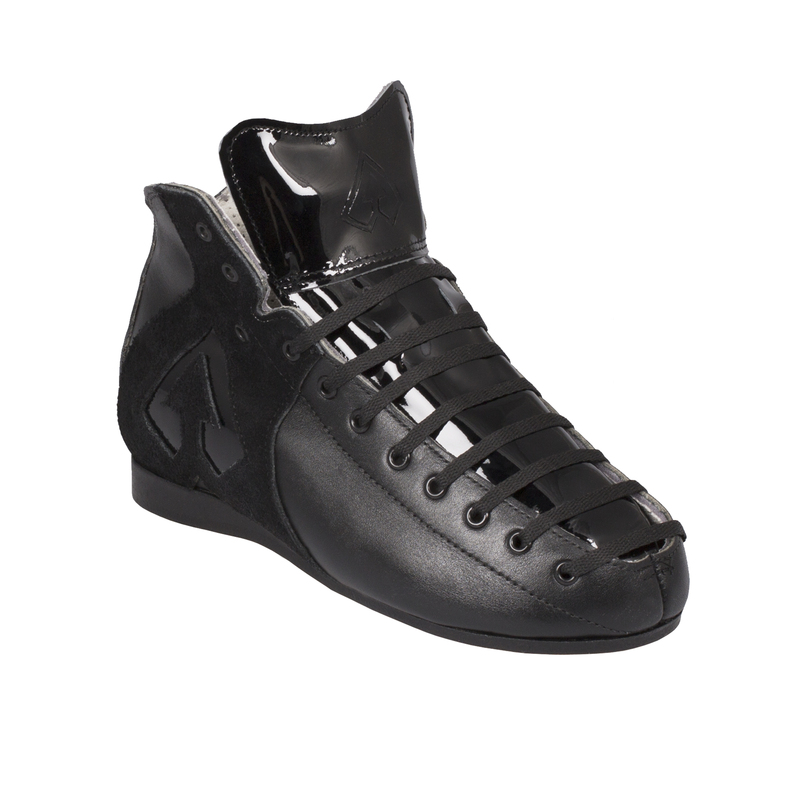 Boot fits a narrow heel, medium/wide ball, rounded/open toe box. After molding, the metal components of skate boots may be very HOT! Watch out for buckles, eyelets, and aglets! After heating and lacing up the boot, try not to move around too much. Ideally you want to be in a skating stance so that your foot is as close to the shape that it would be while skating. Moving around in the boot will not allow the boot to cool in a uniform manner. Finally, after initial cooling, allow the boot to stand for several hours (up to a day) before any rigorous skating! This option is for individual problem areas (toes, arch, outer foot), and lets you mold one section at a time. Keep the gun/dryer approximately 6-8 inches away from the boot, moving in a small circular pattern so as not to over heat one spot. This should take about 3 minutes with a heat gun and 6-7 with a hair dryer. Once the material is pliable, use your hands to massage & push out the problem spot, and hold until cool (blunt end of screwdriver can be used to push out particularly tight spots). This process can be repeated as many times as needed. This option allows you to mold all three spots at once. Mold only one boot at a time! First, pre-heat oven to ~175 degrees; do NOT exceed 200 degrees! Remove insole, laces, toe stop, wheels, and bearings (cushions can be left on). Place boot/skate in oven on rack or cookie sheet for 3 minutes. Remove boot (it will be HOT!). Insert insole, place foot in boot and lace up (wearing socks you wear while skating). Stand up in boots, in skating stance, and wait until cool. This proces can be repeated as many times as needed.